Pharrell dropped in for a surprise visit at The Equity Project (TEP), a Manhattan charter middle school yesterday, as documented by the New York Daily News. A group of student performers was working their way through his Hidden Figures soundtrack contribution, "Runnin'," before Pharrell emerged from backstage to give them an assist. 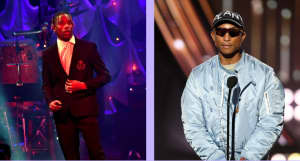 In the clip, Pharrell thanked TEP for bringing him out to "meet with such talented, talented, talented artists," and spoke to the kids about continuing on their path in music. The event was a co-production with Amp Up NYC, a nonprofit partnership between Berklee College of Music and Little Kids Rock dedicated to music education. Watch Pharrell accompany the kids for "Runnin'" and another Hidden Figures track, "I See A Victory" above.